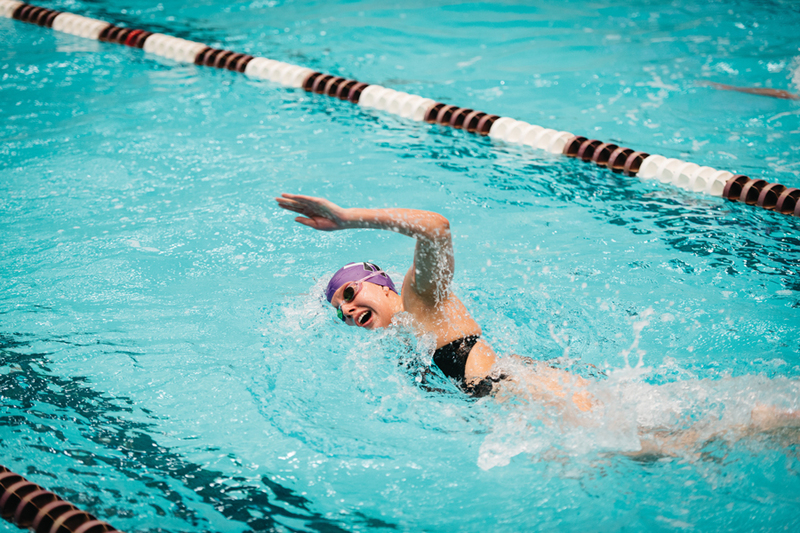 A Northwestern swimmer takes a stroke. The Wildcats struggled this past weekend in blowout losses to Minnesota and Purdue. Faced with tough Big Ten competition, Northwestern fell short after traveling to the final meet of the regular season, losing 283-70 to host No. 18 Minnesota and 269-84 to Purdue. The two-day meet was a potential preview of the Big Ten Championships in mid-February, where the Wildcats (6-5, 3-3 Big Ten) will again face the Golden Gophers (9-1, 5-1) and the Boilermakers (5-3, 3-2). After the tough weekend, coach Abby Steketee said she doesn’t want the outcome of one meet to have an effect on the team’s performance at the conference meet. “Taking it as it comes and controlling what you can is really what I’d like to see coming out of this meet,” she said. Junior Olivia Rosendahl delivered a standout performance in all three diving events. She placed second in the 1-meter and third in the 3-meter on Friday, and second on the 10-meter platform Saturday. Her platform score of 289.15 points was her best performance of the season, far better than the 253.95 points she posted at the TYR Invitational in November. Senior Mary Warren put forth consistent swims, placing second in the 50-yard freestyle in 23.12 and fifth in the 100 free in 51.58. She credited her consistency to her mentality of focusing on her own lane and what she could control, even when faced with fast competition. Sophomore Malorie Han also swam the 50 free, touching sixth in 23.94, and the 100 free, touching eighth in 52.39, in addition to four relays. It was her best meet of the season, according to her coach, and one of the most fun, according to Han. Because the 50 free is so short, it’s hard to predict how the race will go, Han said. She finally fixed some technical aspects of her race, like putting her head down into the turn and not breathing, and was happy with the end result, she said. Even with a positive mentality, it was still not enough to overcome Minnesota or Purdue, as the Cats did not win a single event. Minnesota won 14 of the 17 swimming events and two of the three diving events, giving them the overall meet win. With just two weeks to go until the conference meet, Steketee wants the team to fix final technical details and take care emotionally.